New methods and materials of working 3 dimensionally and carving through space were used and developed. Prominent was the use of welding and iron. 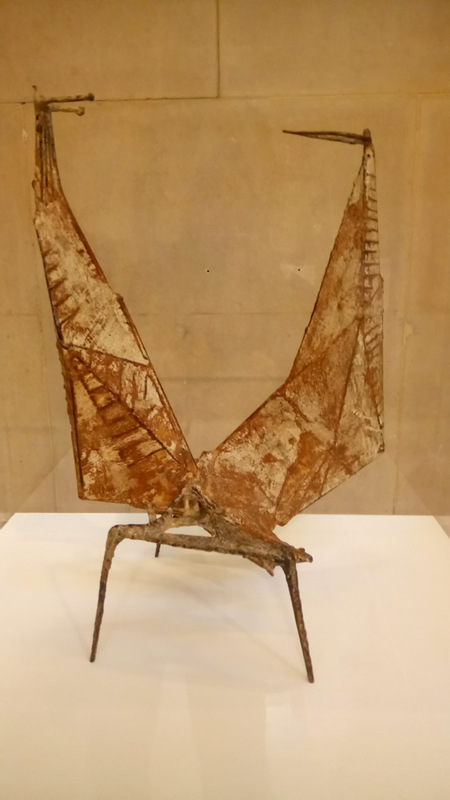 Lynn Chadwick learnt to weld in order to execute The Fisheater. An enormous skeletal free-standing mobile. One of his first. The lunging part of the sculpture is both sinister and beautiful with its graceful and delicate moving elements. 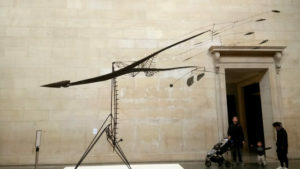 In Conjunction, Chadwick uses the new technique forming the outline of planes with welded metal and filling them with a plaster/iron mix now rusted to give the desired effect. It is also one of his first depictions of the human couple. Part of the display consists of entries to an international competition to design a monument to ‘The Unknown Political Prisoner’. Organised by London’s Institute of Contemporary Arts in 1952, 3,500 artists from 57 countries entered. Although there was no apparent political bias, no entries came from east block countries. The Grand Prize went to Reg Butler. His planned 300 foot monument rising from a rock foundation was never realised. Entries by Bernhard Heiliger (West Germany), Luciano Minguzzi (Italy) and F.E. MacWilliam (Britain) were short-listed. 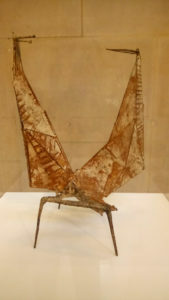 The maquettes can be seen in the exhibition. 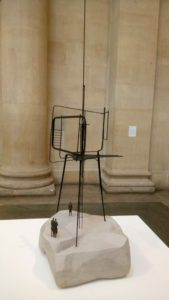 A compelling maquette by Geoffrey Clarke is also shown. However, he entered a different model into the competition. Human experience is transferred into animals creating symbolic totems in works by Elisabeth Frink, Henry Moore and others. This exhibition is a wide ranging, thoughtful, exceptional collection of 3 dimensional work that is well worth exploring and absolutely essential for anyone interested in sculpture, British or otherwise.